Did you know that lightning strikes more than ONE MILLION trees in the United States every year? The majority of our lightning strikes in the southeast are to conifer trees. What is a conifer tree? Pine trees are predominately conifer tree in the south. It has been our professional experience at Gordon’s Tree and Crane Service that Pine trees struck by lightning will almost always either die or distress them making them susceptible to insects, primarily PINE BEETLES. 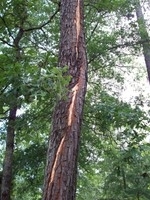 Hardwoods trees that have been struck by lightning have a much higher survival rate. How do you know that your tree has been struck by lighting? In most cases, the bark of the tree is peeled off down the trunk of tree. Lightning struck Pine trees must be removed for the safety of your home and persons. The sooner that a lightning struck tree is noticed and action is taken, the easier it makes it for treatments. a rotted tree due to lightning is more hazardous therefore more costly. In many situations your insurance company will help pay for the removal of a lightning struck tree. Contact your insurance company, and then contact Gordon’s Tree and Crane Service for an estimate.